We love LEGO here on The Centsible Life, so it’s only fitting that we share a fun LEGO gift that you can give your kids, or your kids can make and give to their friends this Valentine’s Day. These mini LEGO marble mazes take just a few minutes to make, require only four items, can can provide hours of fun. Plus, kids can create new mazes over and over again by just moving the pieces around, or adding new pieces of LEGO from their own collection at home. Cut the LEGO base plate into quarters using the scissors – I counted 16 studs in each direction for center. Begin building your maze from the outside in, you need to leave two studs between LEGO pieces for the marble to run through. Place a marble into the maze, and then wrap it in clear plastic if you like and attach a gift tag. 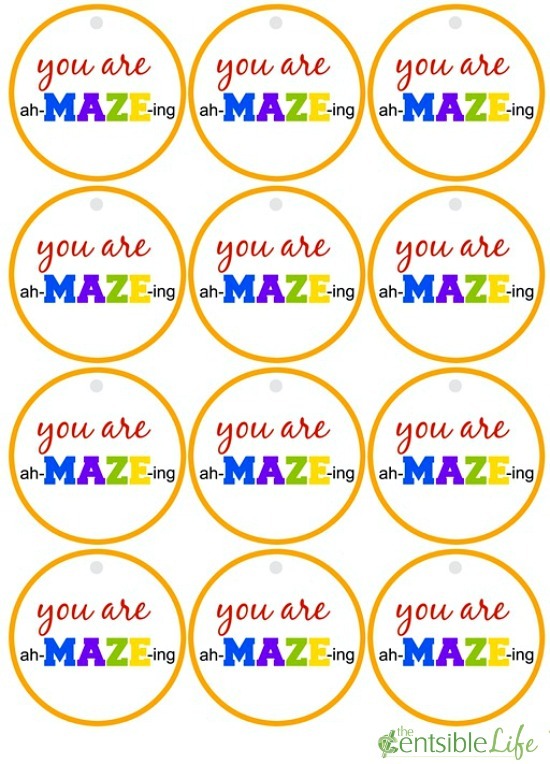 I’ve made some for you to make it easier so feel free to download and print the gift tags below. Kids are going to love these fun mini LEGO marble mazes for Valentine’s Day. They would also make a great party favor for a LEGO themed birthday party, or pop one into a Christmas stocking. Have an ah-MAZE-ing good time with these.